The landscape of PET/CT imaging is rapidly changing. 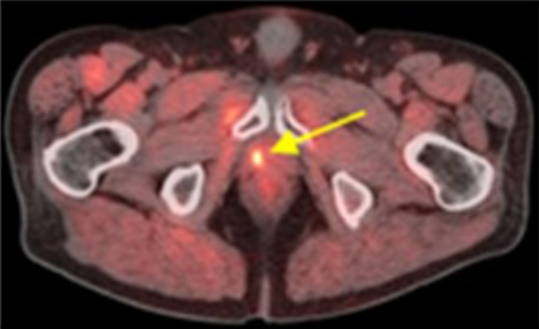 Traditionally, physicians have used a sugar based radiopharmaceutical, 18Fluorodeoxyglucose or 18FDG, to perform the majority of PET/CT imaging. Over the past 20 years, this imaging agent was the only option available to many facilities across the United States. Recent breakthroughs in research, reimbursement, and radiopharmaceutical manufacturing have made it so that physicians and patients will begin to have access to medicine that is designed for their unique situations. Axumin (18F-Fluciclovine) is indicated for PET imaging in men with suspected prostate cancer recurrence based on elevated blood prostate specific antigen (PSA) levels following prior treatment. It has been found that there is an over expression of amino acid transporters in certain cancer cells. This overabundance of amino acid transporters is typically easier to identify among normal, healthy tissue than traditional imaging methods. The body recognizes this drug as an amino acid and actively transports it to potential areas of concern. Why look into this radiopharmaceutical? Axumin allows healthcare providers to pinpoint the overexpression of amino acids associated with prostate cancer. Increased visualization of the prostate bed— no bladder interference during imaging, as with traditional 18FDG. 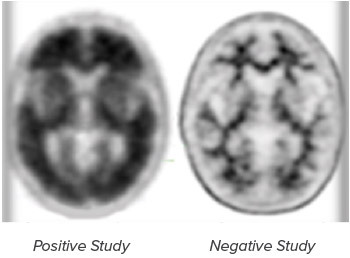 PET imaging with Axumin can lead to quicker detectionof tumors. Other imaging methods rely on physical (structural) changes in the body for tumor detection, whereas Axumin detects changes on the physiological (cellular) level, which can occur weeks, even months quicker than physical changes. Axumin is a great tool for visualizing the prostate bed which can be challenging using traditional methods. NETSPOT (68Ga-Dotatate) is indicated for use withPET for localization of somatostatin neureceptor positive neuroendocrine tumors (NETs) in adult and pediatric patients. 68Ga-Dotatate binds to somatostatin receptors, with highest affinity for subtype 2 receptors (sstr2). It binds to cells that express somatostatin receptors including malignant cells, which overexpress sstr2 receptors. The FDA has recently approved a therapy for NETs that uses the same Dotatate as the PET imaging agent and replaces the 68Ga with 177Lu. The theranostic (see it,  treat it) approach to treatment has finally become a reality! There are many studies that demonstrate a relationship between increased β-amyloid plaque and Alzheimer’s disease. The radiopharmaceuticals bind to this β-amyloid plaque. 18Fluorodeoxyglucose (18FDG) is a sugar molecule that concentrates in areas of high glucose metabolism. Healthcare providers are seeking to determine whether there is an abnormal amount of uptake of this tracer in a particular area of the body which may be indicative of a particular health concern. This is the most widely used imaging agent in the world of oncology. Many referring physicians are familiar with this drug and its applications for oncologic purposes. It is generally accepted as the drug to use for most cancers. Many physicians and facilities are not familiar with the other indications and usages of this imaging agent. Examples include: Viable myocardium—this drug can be used to determine what sections of the heart are still viable and have living, functioning cells. Brain – Many times, 18FDG can add valuable information that a neurosurgeon needs prior to surgery. 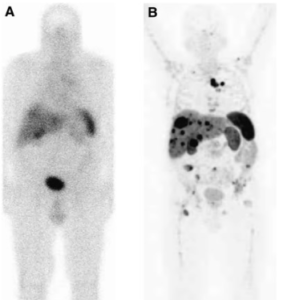 Functional changes occur much earlier than physical changes—PET/CT images often compliment CT or MRI images. This radiopharmaceutical is most commonly used to identify cancers of the bone or cancers that have metastasized (spread) into the bone. The Sodium 18Fluoride (NaF18) ions are deposited directly into the bone matrix and bone surface. Common sites are newly mineralized bone, such as during growth, infection, malignancy (primary or secondary), after trauma, or during inflammation. This drug is much better at targeting skeletal activity than FDG and provides a much clearer image than traditional nuclear medicine bone scans. These 3D images are also quantitative which allows physicians to precisely measure the activity within a lesion – allows for a more accurate interpretation of the response to treatment.